My husband and I were together for five years before tying the knot, and the only real vacation we had taken together was a week in San Francisco as poor college students. 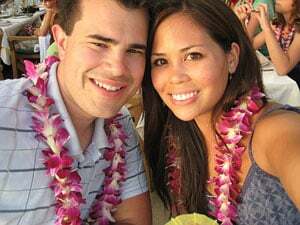 Choosing our honeymoon destination of Hawaii came easy- neither of us had been there before and we shared equal visions of what the islands had to offer. My husband's parents were kind enough to gift us with the costs of our airfare, lodging and rental car, and amidst our concerns of how we might afford the activities we wanted to experience, we stumbled upon Traveler's Joy. Our guests found ease and comfort in using Traveler's Joy, and we were blessed with some of the greatest experiences we will ever share as a couple. We spent 10 days experiencing Hawaii, half of the time on the island of Maui and the other half on Kauai. 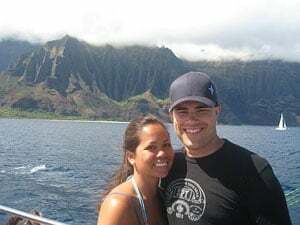 We chose to visit Maui first, departing 2 days after our wedding on June 30, based on recommendations from friends and family for a sense of adventure and beauty since we were still wound up and excited from our wedding. We wanted to spend the last half of our trip on the island of Kauai to really get in touch with nature and relax before heading back to our version of 'the real world'. We were very happy with our decision, because the two islands were very different from each other and we left with a number of memories and experiences from the culture of the Hawaiian Islands. When we first landed in Maui, we couldn't have been more excited. From the plane you could see straight into the clear blue water. The weather was a little humid but we didn't mind- it gave us a feeling of 'island adventure' as we drove our Jeep towards Lahaina. We stayed in a lovely condo right on the water in Kaanapali, at a resort called Papakea. The condo's lanai offered unobstructed views of the ocean with the breathtaking island of Molokai just 9 miles away. I can't even begin to describe the sunsets we saw while we were there. My husband and I are huge photography hounds and we were blessed with endless photo opportunities on the islands. We used our Traveler's Joy gifts right away. The first night we were in Maui we went to the Feast at Lele luau in Lahaina. It was just fantastic and there would have been no way we could have afforded the experience without the registry gift. We were given the best seats in the house, at a sweetheart table just for the two of us, right in front of the stage. The dancers began their performance just as the sun was setting. The food was amazing and we were served cuisine from various islands and cultures throughout the night. Touring Maui on our own with a guidebook in hand (Maui Revealed) was more of our vacationing style. We hiked to various beaches and spent a few mornings snorkeling. Swimming with sea turtles became one of our fondest memories. We also surfed in Lahaina, an activity that we both love but don't get to do very often because of work. Our greatest Maui adventure lay in our trip to Hana, driving along the Hana highway which consisted of more than 600 turns along the cliffs of Maui. We had our guidebook in hand and hiked to amazing views of the coastline and hidden waterfalls. We started the trip very early in the morning with the top of the Jeep down, and within ten minutes of driving on the highway got caught in a downpour! It made for some great laughs. Our favorite part of the 'Road to Hana' was hiking to a waterfall called Wailua-iki. It was a fairly long hike and once we got there, we had the entire place to ourselves. Towards the end of our trip we had the pleasure of eating at the acclaimed Lahaina Grill, a feast which would have not been possible had it not been a gift from our registry! We ate the best halibut and salmon we have ever had. The restaurant was aware that we were honeymooners, and they gave us free dessert (crème brulee, our favorite), a card signed by all the employees at the restaurant, and took a picture of us. They really made us feel special and we were very appreciative of it. When we left for Kauai, we really didn't think our trip could have gotten any better, but it did! The island of Kauai is so green, lush and beautiful, you might think you're dreaming. 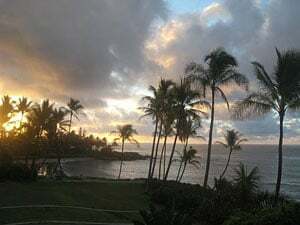 We rented another Jeep and drove to our condo on the 'Coconut Coast' of Kapaa, which had sweeping views of the eastern Kauai coastline. This time we got to experience the beauty of Hawaiian sunrises (and rainbows! ), rather than sunsets from our lanai. Our time in Kauai was the perfect way to end our honeymoon. We hiked to beaches where no one else was around, splashed around in lava pools, found the best sushi restaurant in the world, and jumped off waterfalls...all at our leisure. The most memorable experience for us on the island of Kauai was the Na Pali Coast Tour, another gift from our Traveler's Joy registry. 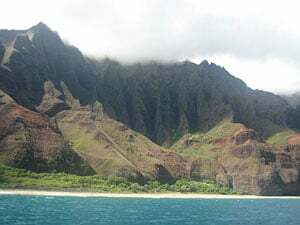 We boarded a catamaran and sailed to the Na Pali coastline, and on the way we saw dolphins playing in the water, and a great view of the 'forbidden' island of Ni'ihau. The Na Pali coastline was like nothing we had ever seen before- teal water crashing against towering sea cliffs, views of gigantic sea caves and waterfalls next to the ocean. The captain then took us to a place to snorkel and the experience was amazing. The water was perfectly clear and warm, and there were fish everywhere. Being with each other and sharing these experiences was the perfect way to begin our married life together. Registering with Traveler's Joy was a great decision for us, because it allowed for our guests to give us our dream honeymoon. Without the registry, our honeymoon would have cost a total of $10,000. We are certainly grateful for the existence of such a registry and without a doubt, we would recommend other couples to use Traveler's Joy, and visit the Hawaiian Islands!